Recently someone on the groovy team ran into a meltdown of their Android Market app. For some reason the app completely vanished, it wasn’t in the application list, and it wasn’t showing up in the drawer either. Puzzled, we tried a few different things but eventually found a solution. Read on for the fix! 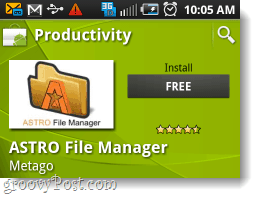 Install ASTO File Manager* on your phone, the free version works just fine. Since your market is likely broken, below I’ve uploaded a copy of the latest .apk so you can sideload it. *There are other file managers that will also work, but ASTRO is free and probably the easiest to use. Once you have ASTRO installed, open it up and browse to system/app. To get there you may need to tap the Up button a few times. 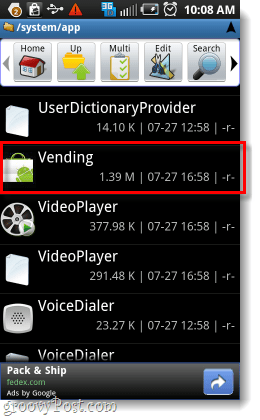 Once in the system/app directory, Scroll-Down and Tap the Vending app. 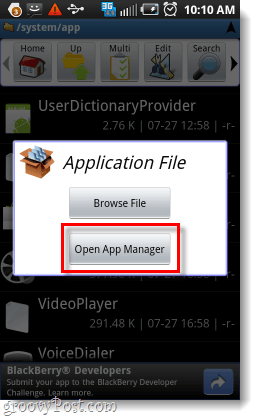 A small pop-up should appear, Tap Open App Manager. Now in the app manager, Tap Uninstall (or Install if it is there instead). This should reset the app for you. Power off your phone, then power it back on. The market should be visible now. Now your Android Market should be back up and running with full functionality! If you are still running into problems, feel free to post a comment below and we’ll try our best to help you troubleshoot it! This is exactly what happened. Thank you so much for posting this. It was very helpful! Hi Genie – Glad the article helped you out! Thanks for the feedback! 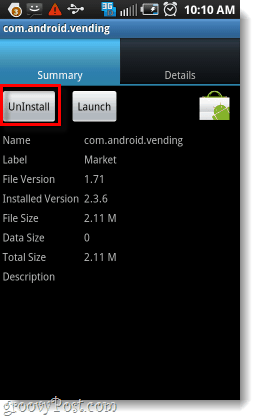 Uninstall -> Market cannot be removed…..